Proven Diabetes Prevention: Lifestyle Modification and The Elderly Advantage! Surprising research demonstrates the elderly have an advantage in preventing Type 2 diabetes by making lifestyle changes. Over 60 and at risk for diabetes? Your age may be an advantage. A few years ago, the Center for Disease Control (CDC) rolled out a national program designed to combat one of our country’s most insidious health problems: diabetes. 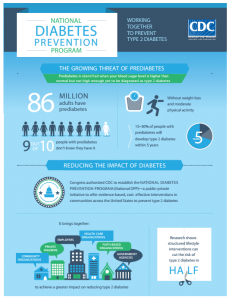 A year-long program designed to help participants make lasting lifestyle changes, the National Diabetes Prevention Program (NDPP) provides practical solutions on how to eat healthier, include physical activity into daily life, and improve problem-solving and coping skills. The program’s success may lie in the age-old “accountability factor” – not only are participants required to report their weekly diet and exercise progress to a lifestyle coach, they have to be accountable to each other. For six months, they meet weekly in a small group to ideally share improvements. They continue to meet once a month for six months after that. While older folks know the physical limits of aging all too well, in the case of lifestyle modifications affecting change, NDPP participants over 60 have a documented advantage. Reported by The New York Times, a large national clinical trial showed that among adults at risk for Type 2 diabetes, this lifestyle modification program and resulting weight loss reduced the incidence of the disease by 58% in 1,000 subjects participating in the NDPP, compared with those who did not. If you think those numbers are impressive, check out the stats for NDPP participants over the age of 60: a whopping 71% reduction in the incidence of Type 2 diabetes for this age group. Offered in every state, often at multiple sites, over 527 organizations (community groups, employers, colleges, churches) offer the program, with the Y.M.C.A. enrolling 40 percent of participants nationally. Ann Albright, who directs the diabetes division of the C.D.C. estimates that in the first two years of the program, almost 50,000 Americans have joined an NDPP, which are aimed at people whose weight, blood glucose levels and other factors suggest they are at elevated risk for developing the disease. Dr. Albright notes that the program is not a “quick-fix weight loss gimmick” but rather a series of lifestyle changes designed to create long-term behavior modification. Dr. Albright says that while a four percent reduction of body weight can produce diabetes reduction, the program shoots for five to seven percent. In Y.M.C.A. programs, the organization says, participants average a 5.7 loss after a year. As noted, those over 60 are particularly successful in the program, with a 71% reduction in the incidence of diabetes, as compared to a 58% reduction in other age groups. So, why do older NDPP participants do exceptionally well? Perhaps they also see more diabetes, and its destructive effects. Dr. Albright tells The New York Times that close to ten% of the population has Type 2 diabetes, diagnosed or undiagnosed, and prevalence only rises with age: for those over age 65, nearly 26 percent have the disease. Feasibly, seeing the life-limiting effects of diabetes in their friends and neighbors motivates those over 60 to commit, and remain committed, to a program with such documented success. Interested in lowering your risk for diabetes by joining the NDPP?